"We both learned to adore animals from our mother, who always made room for them in our lives. "Sam [Gale's current kitty] is about 14 and her background makes her a lady of mystery. She is obviously a purebred Himalayan. When she was about 5, a friend found her abandoned at her apartment complex. She seemed to have been abused and it took weeks for my friend to get close enough to catch her. 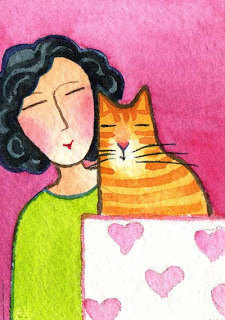 "My mother's cat had just died, so the friend gave her to my mother. Sam spent 4 days hiding under the piano, much to my mother's dismay. On the 5th day, for no apparent reason, she just marched out from under the piano and onto the sofa next to Mom. They were boon companions for 5 years until Mom died suddenly in 2005. "Gale took Sam, who mourned Mom's death deeply. It took her about a year to realize that Mom wasn't coming back, and then she settled in and has bonded closely with Gale. She is at least 14 and has battled some health issues but is doing okay at this point. Sam is tiny -- only 5 pounds, but the Queen of her Domain and can be a bit sniffy with the help (i.e. Gale) when things aren't done to her satisfaction. She loves to cuddle and sleep in the sun and has a loud purr that is out of proportion with her size." Can you believe it? We've arrived at Cat Lady No. 364!! 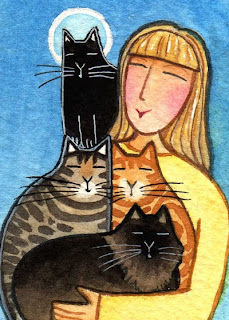 Tomorrow is the big day when I will post Cat Lady No. 365! What happens next? I will keep counting, but with a few changes and surprises. 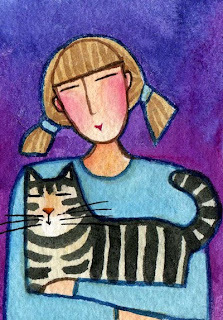 In the mean time, take a stroll down memory lane if you'd like, and meet all of the Custom Cat Ladies and Pet People that I have had the joy of getting to know over the past 14 months: Gallery of Custom Portraits. 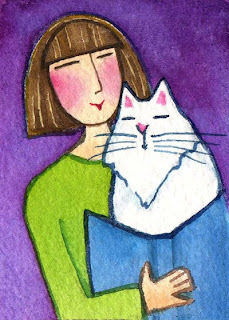 Cat Lady Barbara is a freelance writer and advertising consultant. 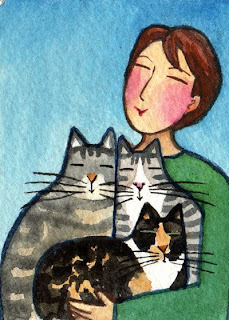 She works at home under the careful supervision of her two cats, Zeni and Buddy who keep the workplace safe by making sure she takes frequent breaks for petting, chatting, and filling any empty food dishes (an excellent stretching exercise for the deskbound...). 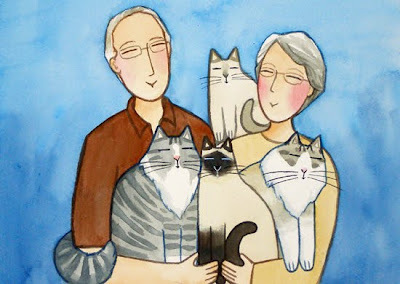 Barbara's husband Dennis is a professional musician, and the cats devote equal time to critiquing his efforts. The two highly recommend routine cat naps for optimal performance in the home office or studio. 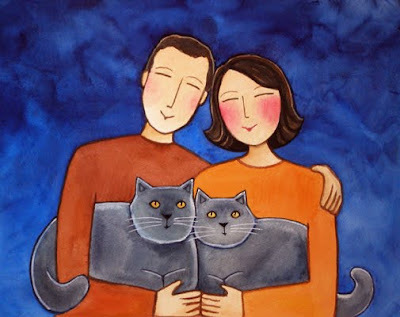 Cat Lady Shannon maintains a very balanced household when it comes to pets: three cats share their home with three dogs. She and her husband Gary are deeply involved with animal rescue. All three kitties - Callie, Pud and Sisko - were rescues. Shannon and Gary frequently foster other animals, so the cats never know who will be showing up for dinner! Best friend Flora says, "They are truly two of the kindest people I have ever known. Shannon works in public relations, and always jokes that she appreciates animals so much because she has to work with people all the time!" 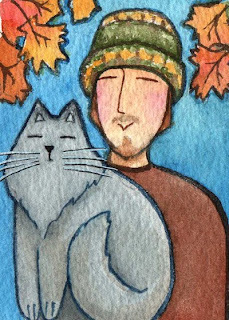 Need more proof that real men love cats? Check out the website Men and Cats. "We've been married since 1966 and have one daughter, Karen. 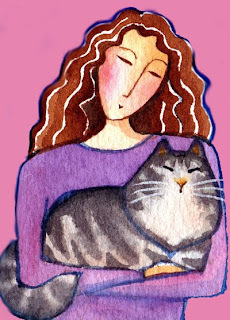 We have had a cat in our lives since Karen was a small girl but we'd never had more than one at a time and they tended to live long lives (17+ to 18+ years). 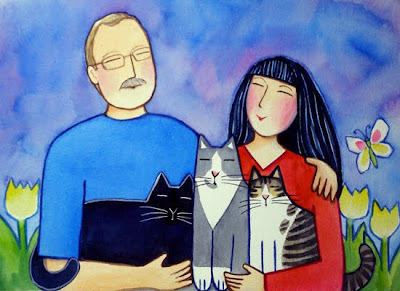 "Then after losing the last single cat, we decided a few months later to get another cat and wanted a kitten -- and looking through various cat publications, Tom was very taken with a breed we'd never heard of before, the RagaMuffin. We contacted a breeder [who happens to be Cat Lady Sharon, No. 269!] and she ended up finding us our special boy, Cole. 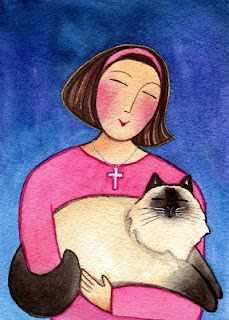 We then got Bliss, our old-style Siamese that same year; the following year after becoming addicted to showing cats (something we'd never known about previously) we adopted St Nick as a good candidate for being shown. "They are wonderful cats -- with lots of experience in riding in cars and exploring motel rooms, being brushed and taking 'show' baths -- and bringing us a lot of joy each day!" 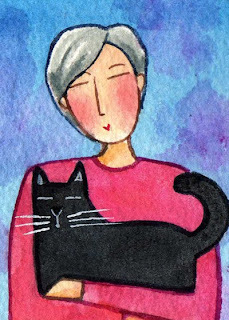 Sharon reports: "Black cat Jazz is mellow, a perfect lap cat, a total cuddle bug, purrs louder than any cat I know. Sometimes, so loud that it keep us up at night while we're trying to sleep. .. He's definitely Mark's cat... as soon as my husband comes home from work, sits down on the couch, Jazz is like a magnet to Mark. Jazz kisses and rubs his cheeks on Mark's chest for hours. He loves having his tailed pulled and his fur brushed for hours." Smooky is the other big boy and "loves to eat and meows as soon as I wake up each morning. He'll sit at the edge of my bed anticipating eye contact.... As soon as he see the whites of my eyes, he'll start meowing relentlessly... Almost every night when I go to bed, Smooky will go to his toy box in the living room and put a play mouse or a yarn ball in his mouth and meow all the way down the hallway to my bedroom and then drop the toy in my room." This has been a ritual for 15 years, since he was a wee kitten! Little girl Mittens was found in an old abandoned garage hidden behind a huge, loud generator. Sharon and Mark were able to rescue her after a week of trying to catch her. She was a month old, barely alive and covered with hundreds of fleas. After a trip to the vet and some TLC, she has grown into a "devilish, cunning, undermining, keen, loving, smart, and just a beautiful girl..." She is extra-special because she is polydactyl--with extra toes on each of her front paws! At one time Sharon and Mark worried that their house might be haunted. Sometimes when they came home from work, their kitchen cabinets were open, and the hallway light was on. As Sharon tells it: "Well, after a year or so, as we were on the couch watching t.v. and through my peripheral vision, I saw something jump up high (about 5 feet) and turn on the hallway light." It was Mittens! "I guess having the extra toes, she's able to grab a hold of knobs without hesitation. Mystery solved... She brings us so much joy and entertainment, she lights up my world and I can't imagine my life without her. She was meant to be in our lives." When you have fur as soft as a bunny, and the cutest meow, and your name is Zippy, it just follows that everyone who meets you wants to scoop you up and hug you. Zippy, however, has other ideas. 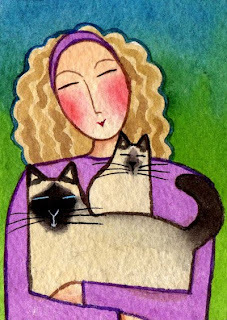 Cat Lady Debbie--who has had Zippy since she was a wee kitten--is the only one who is granted permission to scoop up and hug. As Debbie's daughter Dana reports: "Zippy loves to be in the same room as you but sure doesn't like being held. In fact she screams as soon as you start to pick her up. My mom is the only one that can hold Zippy for an extended amount of time." Debbie, who works at an assisted living community and loves helping people in any way that she can, has obviously won the heart of Zippy! Tender hearts are obviously genetic. Take Cat Lady No. 45, ( SnipPet Creator Carrie), for example. Devoted animal lover, tireless animal rescue volunteer, and all-around sweetie pie. Turns out, that's exactly how you could describe her parents, Cat Lady Linda and Feline Fella Putney. As Carrie tells us: "Mom and Dad are the best pet parents around! Those furry kids are so lucky! 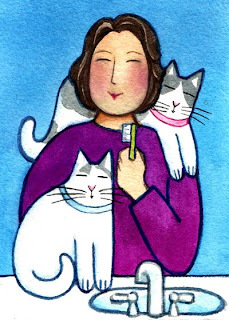 Mom volunteers doing a clean and feed shift weekly at Safe Haven for Cats...and also donates many of her paintings and artwork to their annual fundraising auction. In addition, she appears on WRAL News once a month with a cat or kitten available for adoption." 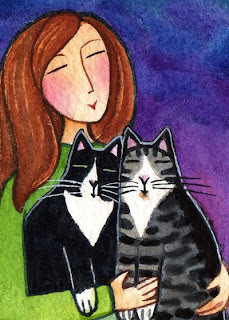 Many of the adoptees arrived via Carrie's rescue efforts, such as orange and white Oliver, tuxedo kitty Sylvester, and Misty the black and white spotted cat--Carrie "fostered her and saw how funny and wonderfully quirky she was and my parents adopted her, thankfully." Henry the gray cat wound up in an Atlanta shelter with a terrible skin allergy after Hurricane Katrina hit...but now has found his home sweet home with Linda and Putney. The most recent adoptee was Cupie. "She was a 'return' at the cat shelter where my mom volunteers. She was very overweight, elderly and at some point had a botched declaw job...in most people's eyes not very adoptable...so my mom wanted to give her a loving home." And last but not least is Boston Terrier Louie, the great love of their life. Louie had been neglected, "had no hair and ended up at the Atlanta Humane Society. I knew my parents loved Boston Terriers, so I told them about him, and the rest is history. They LOVE that dog more than I can explain." Inspired? If you have room in your home and your heart, please consider adopting a pet from a shelter or pet rescue operation near you, or why not volunteer an hour or two each week! A great way to start out the New Year! As Cat Lady Shannon will tell you, selecting the ultimate chair is a very important key to sharing life with a large menagerie of pets, especially one that includes both felines and canines in a wide range of sizes and ages. Luckily, Shannon found the perfect pet chair about 6 years ago-- a large and cushy armchair that can accommodate multiple dogs and several cats at any given time. 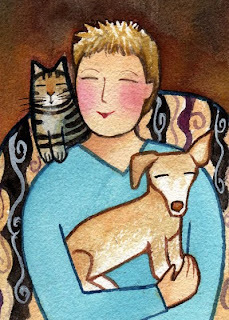 Her favorite chair-mates include the newest love of her life, tiny tabby tiger kitten Pixel, and elderly dachshund-mix Stella. Shannon's daughter Danielle tells us: "Pixel is a shy but playful little kitty. She loves to sit on Shannon's shoulder at night when she is sleeping. Stella is a really old little dachshund mix that Shannon and Camilla rescued and now is obsessed with Shannon. She is a really funny little dog who will make the most horrible noises to get Shannon's attention. She is happy as long as she is in Shannon's lap." 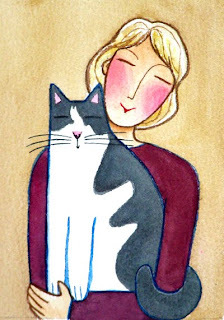 Here's to lap-dogs, purring kittens, and ultimate armchairs! Bathrooms can be a chamber of horrors for some cats (all that running water! ), while others find it a wonderland of amusement. Take Gunther and Iris, for example... a brother and sister pair of fearless felines who love to supervise toothbrush time with Cat Lady Camilla. According to Camilla's daughter Danielle, "Gunther is very lazy dazy and is a little goofy sometimes. Iris loves to sit on Camilla's back while she is bent over the sink brushing her teeth. She also likes to drink the water from the sink when Camilla leaves it running for her." Regular visits to your vet, which will include an oral examination. Daily care of your cat's teeth at home. Regularly check your cat's mouth for any signs of dental problems. If you notice any of the symptoms such as drooling, bad breath or red or bleeding gums, seek veterinary attention immediately. Avoid feeding an exclusive diet of canned food. Resistance is futile; just ask Cat Lady Sita and Feline Fella Justin...One look at their gorgeous fluff-balls with their soulful orange-yellow eyes and your heart can't help but melt. British Shorthair Cats Wendell and William are brothers, born six months apart. Big brother Wendell is the shy one and at four years old weighs 15 pounds. William, who is six months younger, thinks he is the boss of things and weighs in at 14 pounds. In spite of the occasional boxing match, they adore each other and are virtually inseparable. Cat Lady Erica and feline friend Jeronimo know that Great-Aunt Hilda likes nothing better than to watch and feed her "hummers", hummingbirds, that is. So with a few clicks of the mouse, Erica just sent a special gift that will be sure to delight Aunt Hilda: a gift to the Nature Conservancy that will protect hummingbird habitats. Need a last-minute gift for somebody special? 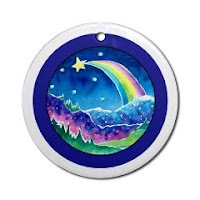 There are many more great nature gifts to choose from and each purchase includes a nature e-card announcing the gift. Cat Lady No. 347...Happy Winter Solstice! 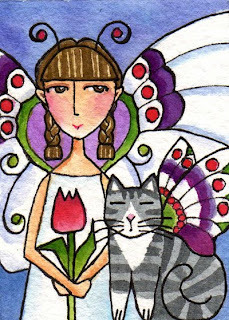 Garden Fairy Lulana and her winged cat Fabinia will be observing the solstice tonight with a large bonfire to encourage the return of the sun and spring. "The winter solstice...is the shortest day and the longest night of the year. "The early Romans, Egyptians, Celtics, and others observed that by December the fields were no longer producing crops, leaves had fallen off the trees, and many plants had died. Daylight hours were waning, and the sun was getting lower and lower in the sky. They feared the sun would completely disappear, leaving them without light and warmth. "They lit bonfires to light up the skies on this longest of nights both for warmth and to coax the sun to return. They thought the fire would call out to the sun, asking it to stop its descent into the earth and return to the sky. "The Saxons and Celtics often kept an oak log--usually the entire trunk of a tree--burning for 12 hours on the eve of the solstice. If the fire did not go out during this period, the household would be protected and see an abundance of crops, good health, and other desirable things in the coming year." 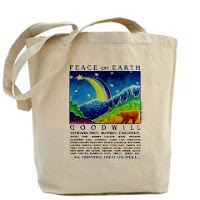 Tote Bag winner is Cat Lady Patricia and Miss Breezy who wish Peace on Earth, Goodwill toward "all creatures great and small". 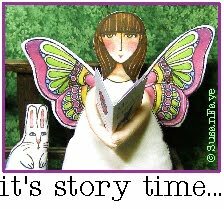 Be sure to visit their Etsy shop and blog Funny End of the Tail to congratulate them! Porcelain Ornament winner is Mr. Ducky Doo from Canada who is passionate about crinkle balls. He wishes Peace on Earth, Goodwill toward "crinkle balls, if only one night a year. After Christmas though and they have it coming to em. ;) Meow!" Read about his adventures at his very own blog What's Up, Duck? 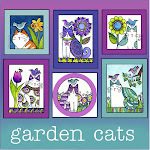 Mini Poster winner is Cat Lady Rose, who happens to be Cat Lady No.338 and co-founder of Angelcat Haven. Her wish is for Peace on Earth, Goodwill toward our ocean friends "hermit crabs, manatees and whales". Cat Lady Blanche is of the opinion that black cats are lucky, and that every day is a lucky day now that feline friend Philbert is a part of her life. 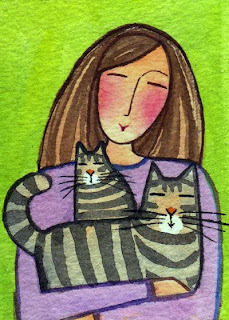 Tomorrow could be your lucky day, if you are one of the winners in the 365 Cat Ladies Giveaway for December. Three lucky names will be drawn at random to win one of three different prizes: a poster, an ornament, and a tote bag. Contest ends at 7 pm PST, so don't delay, enter today!! 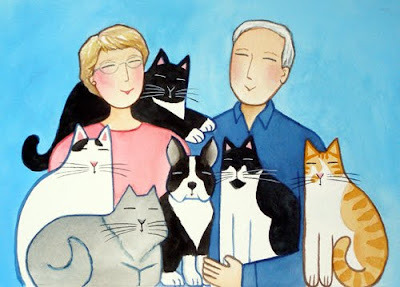 For details, visit Cat Lady No. 339. Cat Lady Meredith is enjoying a group hug with Sandy and Sam, just adopted from a local shelter. Are youhinking about adopting your own purr-monster this holiday season? As part of Iams Home 4 the Holidays campaign, Cat Lady Karen is featuring a different feline in need of a forever home each day at her Cat's Meow blog. You'll also find a link to locate adoptees in your area. The Iams 2009 campaign launched on October 1st, and joining forces with 3,500 animal organizations, their goal is to help 1.5 million pets find homes this holiday season. So What Happens after Cat Lady No. 365? 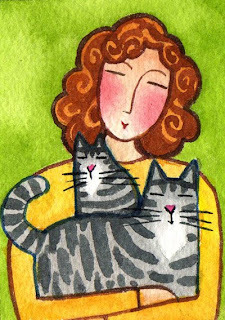 I'll keep adding cat ladies of interest, but at a more relaxed rate--perhaps two a week instead of on a daily basis, with a focus on the real-life feline fanatics that are featured in my custom portraits. Another change will be having more of a newsletter feel--featuring stories and updates from 365 Cat Lady and Lad alumni and rea ders. And watch for an announcement in early January about a new project or two which I hope all of you will enjoy and participate in! cattitude! 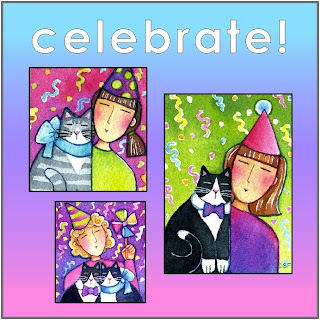 I'm looking forward to another fun-filled year of fabulous felines and the women (and fellas) that love them! Cat Lady Alicia takes great pride in her bow-making skills. Whether it be a pompom bow, a florist bow, starburst bow, or single-ribbon loop bow, her bows are always picture perfect. 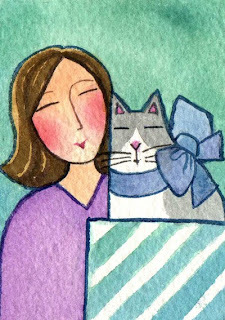 Cat Lady Shannon is always looking for creative and earth-friendly ways to wrap gifts. 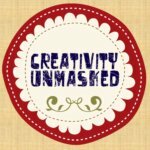 Wrap Art by artist John Boak is one of her favorite resources for great ideas using scraps of paper and found objects from around your house. Newly adopted cat Aretha cannot resist the lure of paper scraps, ribbons, and an empty box and is always at the ready to help where she can. She considers herself to be the ultimate "found object"! 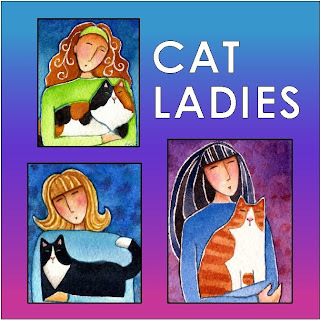 Have you entered the 365 Cat Ladies Giveaway for December yet? Click on this link to find out how you can win one of these three prizes. Contest ends Sunday night. 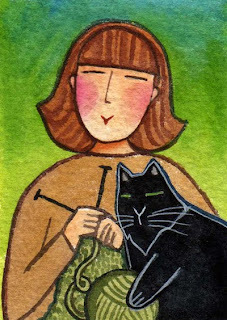 Cat Lady Consuela and her feline friend Amadeo are looking forward to the beginning of Las Posadas tomorrow night. Las Posadas (Spanish for "lodging") is a traditional 9-day observance which re-enacts Mary and Joseph's search for room at the inn. A processional , ususally carrying lighted candles, walks through the community streets each night. The processional stops at a previously selected home and asks for lodging for the night. The people are invited in to read scriptures and sing Christmas carols called villancicos. Refreshments are provided by the hosts and might include ponche navideno and bunuelos. Amadeo's favorite part is the pinata, and chasing all of the little toys and candies that go skittering across the patio when the pinata is finally broken! 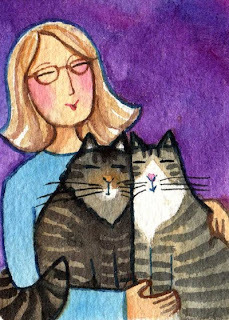 Jolene and tabby friend Duke have lots of loving-kindness in their hearts today after reading the responses so far in the 365 Cat Ladies Giveaway for December. 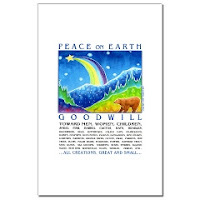 Readers are asked to complete this phrase: "Peace on earth, goodwill toward____________ ." 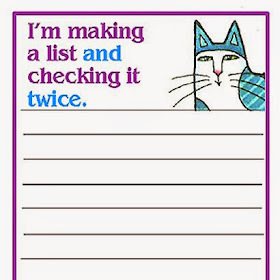 Would you like to add to the list? Visit this link and leave your ideas in the Comments section at the end of the post. By doing so, you will be entered into a drawing for a chance to win one of three prizes. Thanks for participating! Cat Lady No. 339...It's Giveaway Time! 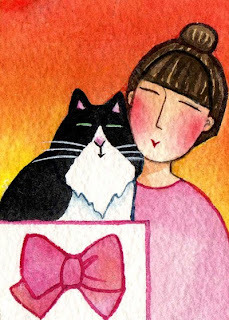 Cat Lady Alena and feline friend Hibiscus would like to announce the 365 Cat Ladies Giveaway for December! 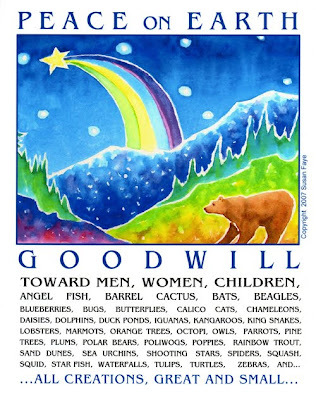 "Peace on earth, goodwill toward____________." You can use a name, a word or many words. Three years ago, Cat Lady Rose became co-founder of a non-profit volunteer cat rescue group called Angelcat Haven in Massachusetts. 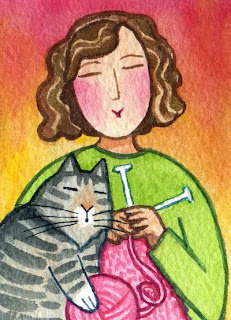 She and friend Cat Lady Angela saw the need in their community for foster-based rescue, instead of a shelter. Now they have over 30 volunteers and have rescued 408 cats since that time! Their cats live in foster homes with volunteers until they are adopted and are"cage free" unless they are sick and require medication or do not get along with other cats. 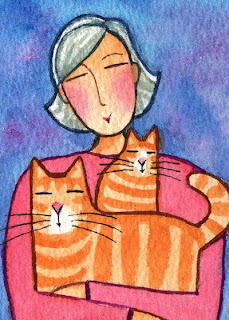 Rose tells us about her own lucky adoptees : "Cecil (orange tabby) was a stray from my neighborhood, as was Bill (brown tabby). I think they are father and son or at least related. Angel (fluffy brown cat) was rescued from my hometown in Pennsylvania last Christmas. My father passed away and when I went home for his funeral, she showed up on my parents' porch in a snowstorm. We brought her home with us." It was with great sadness that Rose and family recently had to say goodbye to the beautiful black cat Inky during Thanksgiving weekend. Inky was one of nine all-black cats from a shelter that Rose had previously volunteered at. Only Rose could tell them apart. "Although it's 2009, people are still superstitious, therefore black cats get adopted less frequently than any other color. [Inky] sat in a cage for seven months and I felt so sad that nobody wanted her, so I adopted her. "She was the sweet companion of my husband and I for six years and was a wonderful, talkative cat who slept in bed with us every night". She was twelve years old. 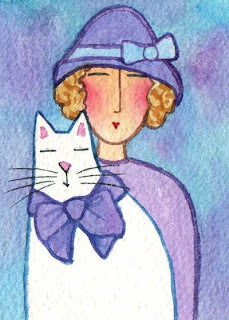 Whether it be a bonnet, cap, toque, cloche or hat, Cat Lady Erin loves to dress up in vintage headwear, and has a hat collection to prove it. 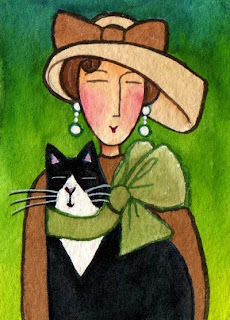 Although not a fan of wearing hats herself, Kitty companion Betty enjoys becoming the occasional fashion accessory in a vintage ribbon bow. For a great tutorial on the history of women's hats visit this link: Vintage Fashion Guild. 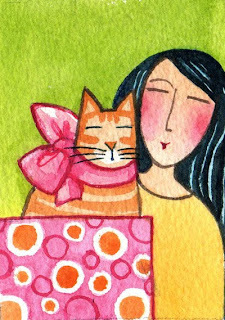 Cat Lady Roberta had to get a little creative this year when it came to ideas for gift-giving. She was laid off from her job a few months ago, and money is tight. 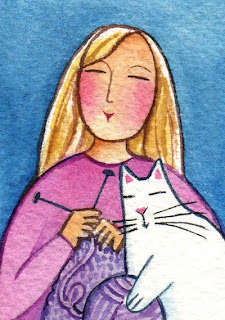 Cat Lady Erika's three favorite things a re knitting, crossword puzzles, and her snow white kitty Bitsy, but not necessarily in that order. In 1912 Agnes Reppelier collected, translated and arranged an anthology called The Cat - Being a Record of the Endearments and Invectives Lavished by Many Writers upon an Animal Much Loved and Much Abhorred . Here is part of an essay included in the anthology. Does this describe anyone you know? "He is a swifte and merye beaste in youthe, and leapeth, and riseth on all things that are tofore him, and is led by a straw, and playeth therewith; and he is a righte heavye beaste in age, and full sleepye, and lyeth slyly in waite for Mice, and is ware where they bene more by smell than by sighte, and hunteth, and riseth on them in privy places." --Translated from the Latin by Thomas Berthlet. Printed by Wynkyn de Worde. 1498. Cat Lady Alison has had a trying year. She had to say goodbye to her beloved 20-year-old tuxedo Katarina in October 2008...followed by saying goodbye to her new kitten Mina only 5 months old --the victim of deadly FIP (Feline infectious peritonitis). Alison began to doubt that she could ever give her heart to another feline. Then a friend, whose one unfixed cat had an unexpected litter of four (mama cat has since been spayed), asked Alison if she would take one of her kittens home. Alison chose a kitten, and her friend asked if she would take TWO kittens, so they wouldn't be lonely....How could she say no? That is how sisters Keely & Fiona found their new home on Earth Day, April 22...and joy has returned after much sadness! Alison describes their emerging personalities: "Keely is truly our 'Supermodel' 'Hollywood' cat (her new nicknames besides 'Big Kitty' - she is BIG). Keely means 'beautiful' in Irish so she is well-named - a very affectionate kitty. "Fiona is my lap cat girl with the tiniest face and meow to match - also affectionate. Fiona means 'fair' in Scottish. She is the explorer of the two and is something fierce for such a wee cat (forget about giving her meds - you'll end up worse for wear)." As Princess Pandora will tell you, it's glorious to be a beautiful white Persian cat, that is, unless you become unwanted and wind up in a shelter. It happens. Lucky for Pandora, there are many rescue operations that specialize in finding new homes for Persian cats, who require daily grooming and sometimes have special needs. Pandora is enjoying her new home with Cat Lady Debbie, who doesn't mind giving Pandora the extra attention that she needs to stay so glorious and beautiful! For more information on adopting a Persian cat, visit the Persian and Himalayan Cat Rescue website. 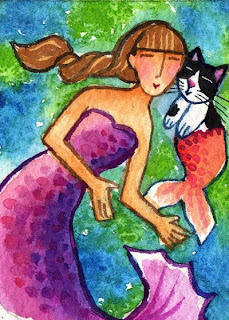 Mermaid Cat Lady Lorinda and her favorite catfish Jona h have a great gift suggestion: adopt a coral reef in honor of a loved one. Coral reefs, home to incredible biodiversity, are in danger... According to the Nature Concervancy, "If the present rate of destruction continues, 70% of the world's coral reefs will be destroyed by the year 2050". The Nature Conservancy's Adopt a Coral Reef program provides critical funds for the permanent protection and restoration of some of the last great places on Earth. Other Nature Lover gift ideas include planting trees and giving carbon offsets. 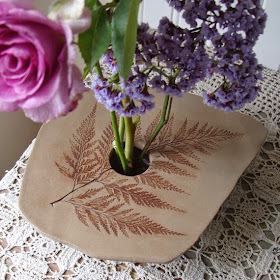 Visit the Nature Conservancy website for more ideas. Cat Lady No. 330..Happy Birthday Sagittarians!! 'Tis the season to be quite jolly, and nothing makes Cat Lady Rhonda more jolly than Egg Nog Rum Raisin French Toast. That, and a kitten. To ensure maximum jolliness for the upcoming season, she just adopted Miss Pickle and Dilly from a local shelter, PLUS she has scheduled three brunches between now and Christmas at which she will serve Egg Nog Rum Raisin French Toast.